Moving your possessions from one location to another is a big job, so the Condo Guy is here to help! When you buy or sell your home with the Condo Guy team, you can take advantage of our FREE moving truck. If you don't need to hire movers but still require a truck, why not use the Condo Guy moving truck? It's free to clients of The Condo Guy (buyers or sellers), as well as to charities. Our moving truck comes with moving pads, an easy-load ramp and a full tank of gas. We offer the moving truck to on a first come, first served basis. Just make arrangements with one of our staff members for your move date and you're on your way. All we ask is that you use the Condo Guy truck for in-state moves only, and return it with a full tank of gas. 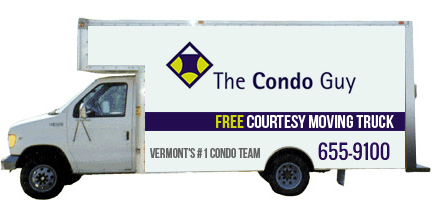 To take advantage of our moving truck, contact the Condo Guy team!